Download information in Adobe PDF format. Become an educated consumer. Learn the difference between double and triple pane styles, and what will work best for your home and budget. The more energy efficient your windows, the lower your heating and cooling costs will be. Select windows with frames and sashes made from premium-grade vinyl. Look for a U-Value rating of 0.30 or lower. Is your window a good fit? Accurate measurements ensure that your new windows will fit properly. Plus, a better fit means fewer leaks. Choose windows from a specialty window dealer or home-improvement store that offers products from a reputable manufacturer. Make sure your windows are installed by a qualified window professional or skilled do-it-yourselfer. Improperly installed windows will not be as efficient, and may void the manufacturer’s warranty. Remember, you don’t have to replace all your windows at once. If replacing windows is not in your budget, don’t despair. There’s plenty you can do to improve their performance. Window Coverings, like blinds and curtains can help reduce cold winter drafts, and block out the summer sun. Storm Windows create an insulating air space when installed. They’re more affordable than new windows, but won’t eliminate drafts from the frame. Indow Windows are thermal window inserts that press into your existing window frames. Indow Windows are much like storm windows, but are easier to install and require no hardware. Insulator Film is an inexpensive option for temporary use in the winter months. This thin, clear plastic is installed with double-sided tape and a hair dryer, creating an insulating air space on the inside of your windows. Take care when removing the double-sided tape to avoid damaging the paint. Select The Window Style: Windows come in many styles and designs to complement every home’s architecture style. Can’t decide? Take the time to visit several window retailers to ensure you get just the right look. 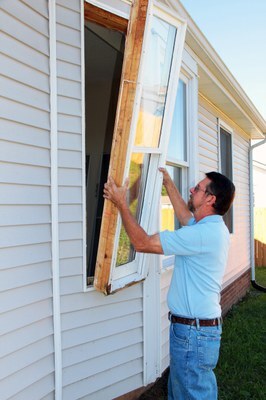 Get Exact Measurements: Replacement windows are made to fit in-place of your existing windows. So it’s imperative that you get accurate measurements. If Your Windows Are Out of Square: This means that your windows have shifted since their initial installation. When you replace a window that is out of square you need to make sure that you use shims in between your frame and the new window to ensure a square fit. Check the Building Codes: Review building codes for window safety glass and egress requirements. Get the Necessary Tools: In order to replace your windows you will need a few tools; caulking, sealants, trim, shims, a level, a drill, and a hammer. Using quality products will make for an easier job. Get Some Expert Advice: Many home improvement stores offer hands-on classes for the Do-It-Yourselfer. Take advantage of these offerings. If your home feels drafty in cold weather or uncomfortably warm from the summer sun, you may be losing energy through your windows. Look at your windows: do you have broken panes, or cracked frames? Are your windows impossible to open or close? These are signs it may be time for new windows.